Happy New Year and welcome to 2015! The other club officers and I hope that you all enjoyed the holidays with your family and friends. We had a very memorable Christmas meeting (read about it here, you can read my 12 Days of Christmas, and see some pictures at our Flickr group). I’m now looking forward to kicking off a new year and seeing you all again. 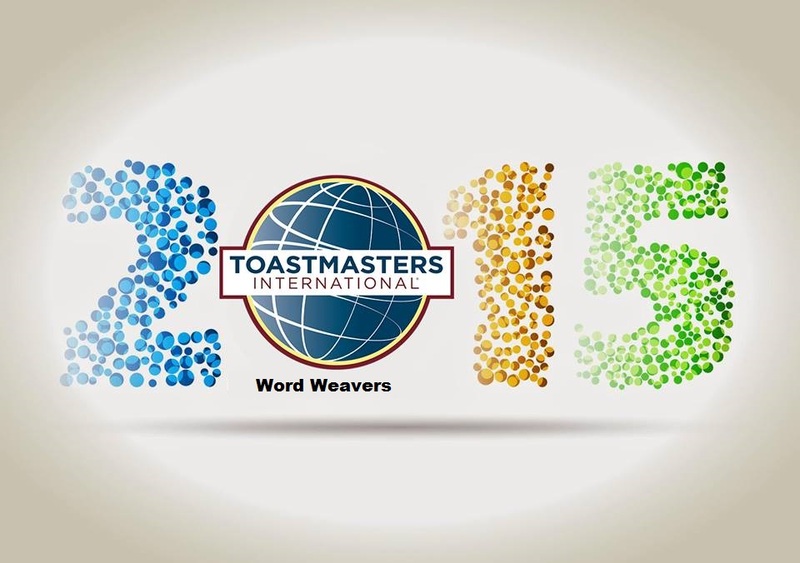 2014 has been a very memorable year for Word Weavers. We celebrated 90th Anniversary of Toastmasters. We’ve had lots of great speeches, lots of laughs, and we’ve seen some incredible growth of some of our members. Michael S has brought some interactivity and enthusiasm to the Toastmaster of the Evening role this past year and he did a steller job leading us through the Christmas meeting. Andrea achieved the ACS, Darryl the ACB, Ron received Select Distinguished for being the F3 Area Governor, and Regina received Presidents Distinguished for being the Division F Governor (as well as being honored for achieving the DTM award at the 2014 D59 Conference in Krakow, Poland). 2015 is destined to be memorable, lets unwrap it get it rolling now! We have meetings on January 14th and 28th. Several of our officers will be attending officers’ training this weekend and we’re getting ready for the second half of the 2014-15 Toastmaster year. In February we’ll be holding our club contest for the International Speech Contest and the Evaluation contest, so time to start thinking about your speech or what role you’ll be able to do in the contests (we need you). Patrizia, mentioned at our Christmas meeting that Norbert was going to be leaving the hospital. Patrizia, Regina, and I met and gathered some pictures to put together a photobook for him as a token to show that we’re thinking about him and that he is in our thoughts and hearts. Regina then put together an amazing book. I personally wanted a copy of the book for my own personal memories and we decided that some of you might like your own copy as well. We’ll collect money at the January meetings from anyone that is interested in their own copy and we’ll order them. In the event that you’re not able to attend a meeting in January please get in contact with Patrizia or me so that we can put the order together. I’m looking forward to seeing everyone in 2015. Let’s make it a great year!